It’s Tuesday and I had scheduled myself to teach 4 classes. Teachers are madly marking exams in preparation to send home grade reports to parents when school closes on Thursday for midterm break. They are delighted to have someone take their classes so they can continue working. In fact, so delighted that 2 more classes got added to the day. As if that weren’t enough, after I completed the last one, I wandered over to visit the form 4’s and found 8 or 9 girls working on math. So we had an impromptu session and walloped logarithms. Those who were there were smiling happily and feeling very smart. Too bad it was so few. Every year logs is one of the big topics they ask me to talk about. It’s always the same. They haven’t a clue about what logs are, but after we talk about it and slog through several problems, it begins to sink in. This year’s form 4’s are a bright and hard-working bunch, so they “pick” it very fast. In Kenya, things are not picked up, just picked. When Fr. Kiriti tells me he will pick me from the airport, I feel like a nice, ripe peach! I’ve been thinking about how to use Maya’s presence to greater advantage. 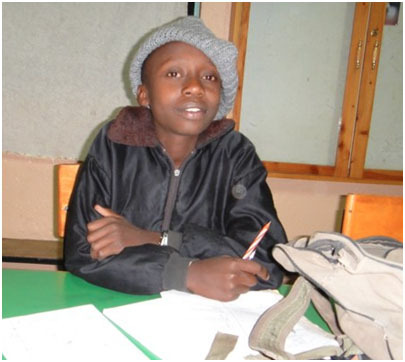 She has really shined as a math tutor in her class, so I asked some of the teachers whether it would be helpful to have her not attend the Kiswahili class, of which she understands virtually nothing, instead going to one of the lower math classes as a sort of teacher’s aide. The Kiswahili teacher might have been a bit put off, but she could see the good of it and agreed. So this afternoon she went with me to 2 Form 2 classes where I was teaching factoring. It was so nice to have another person wandering up and down the aisles, answering questions and checking their work. The form 2’s loved having her there and she loves helping out. Wish I had a picture, but I get too busy and too involved to think about using the camera. I’m finding the teaching most invigorating. I come out of each class feeling totally energized, but then at the end of the day I’m exhausted. Things are coming thick and fast. I wish I had time to write everything, but I can’t do things and write about them at the same time. I need a voice activated writing device! Today was another teaching marathon. Tomorrow the school closes for 4 day midterm break. Teachers must mark exams so the parents get a midterm report which the student takes home, except that some 150 (just over ½) the students are being “retained” because they didn’t meet the target. This is not atypical in Kenya, but I am dismayed that it’s happening in SFG. It’s something that bedevils me. After classes were over today, students and teachers met in their “families”, a new plan, which I love. Each teacher is assigned a group of about 25 students from all 4 Forms. They refer to themselves and “mother” or “father” and the students as “my daughters”. They sat on the grass in the middle of the quad, chatting and enjoying being together. I wandered around, looking for Pauline and noticed a group of “orphans”. “Who is your mother or father?” “Madame, Ruth (principal)” “Oh, right, she’s in Mombasa at the meeting of secondary school heads. I’ll be your step-mom today, but if I sit down on the ground, will you give me a hand up?” Of course they did. I didn’t know whether there was something specific teachers were to talk about (there wasn’t, I later learned), so we talked generally about going home. One form 2 girl offered, “For those of us who got D+ and are being punished by having to stay—we want to go home too. I don’t think it’s fair.” “Don’t think of it as a punishment, but as an opportunity to catch up—to fill in the blanks of things you haven’t learned. Remember, your teachers are giving up their holiday break time too, when they would rather be home with their families. Your teachers aren’t doing this to punish you, but to help you.” It was wonderful to see the expression on her face and that of others change as we put a positive spin on it. I brought some videos for the SFG students, so I suggested they might be able to watch them one evening. The cheered them a bit too. Like any other school, SFG has it’s problems. Retaining students during breaks is a common way of “motivating” students to work harder. We talked about ways to study to ensure that they have learned well and would not be “detained” again. We talked about their right to learn. “Go to your teachers when you first realize you’ve not understood something. Ask your fellow students for help. Re-do homework until it is clear to you.” I talked about teamwork, that the students who “pick” things faster have a responsibility to the others because we are a family, a team. I talked about Maya, who in 7th grade was a somewhat reluctant learner and how she has changed her attitude and her work ethic and now she is a star. Speaking of Maya, I love the way she is finding her place. 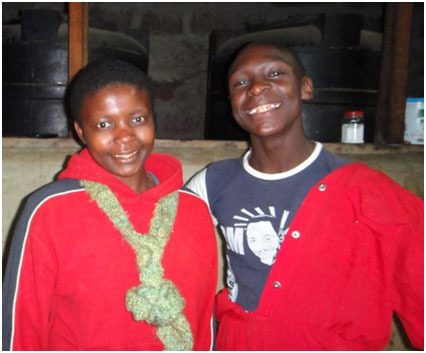 During evening preps she now goes to the Form 1 or Form 2 classes and helps the students. They are thrilled to have a chance to be with her and she is loving doing that. Each day I see her feeling empowered as she discovers what a contribution she can make. She’s still dealing with the food issues, the potty and shower issues, having to hand wash clothing, but she’s able to set those aside in favor of the bigger picture. I had planned to take her on Thursday to one of the craft markets in Nairobi. I’d asked Fr. Peter whether I could steal Ben (parish accountant and great driver—I’d never drive in Nairobi) and Jecinta (social worker and great bargainer). After I explained that I buy items which I take home, donors contribute for them and the money is all sent back here, he agreed. It was all arranged until Jecinta called to say the market is only open Saturday and Sunday. That wasn’t my memory from last year, but she insisted. Maya was greatly disappointed, but took it well. RATS! Then this evening I realized I hadn’t told Ben the trip was off, so called him. “No, don’t you remember the one we went to last year? It’s open Tuesdays and Thursdays.” OK, scramble, scramble. The trip is on again. I called Esther to get a message to Maya that I would pick her in 15 minutes, bring her home for the night so we can get a good start in the am. Then I asked Julia for some boys to go with me, as it was after dark. Believe me I never fail for volunteers. Five wanted to go, assuring me they could all fit in back. Just as we were leaving the compound, deputy Peter called to say they had a medical emergency and could I bring a girl back to the hospital, along with Esther and Andrew (teacher on duty for the evening). There was no way 5 guys could sit in the far back of my little Toyota Rav 4, so I ended up with just Simon and Patrick, who had been in my kitchen doing research on WW1 and WW2 on my computer when all this came down. Left – Simon in the kitchen with Ruth. The kids love to have their pix taken and then giggle when they see themselves. Below – Patrick is in the dining hall, doing his homework. So off we went, with Simon, the biggest boy, and about as sweet and thoughtful as a young man could be, and Patrick, quiet, bright and also very sweet. We arrived to find a very small girl named Elizabeth with intractable hiccups. This may not seem like a medical emergency, but I’ve never heard anyone hiccup like that. It was faster than a heartbeat. She has experienced this twice before and had to have an injection to stop the spasms of the diaphragm, which cause the problem. We dropped them off at the hospital (more like a clinic) and arrived back, with Patrick carrying Maya’s backpack and Simon escorting us back into the children’s home compound. It is so touching how these guys take care of us, particularly Simon who is always available and eager to help. Maya immediately changed into home clothes and sat at my small table. “It’s so good to be back here. It’s amazing how nice this seems to me.” My little “house” is so small and basic, but after the dorm room and other accommodations at school, it seemed like a palace to her. More news tomorrow, I hope with pix of the market.